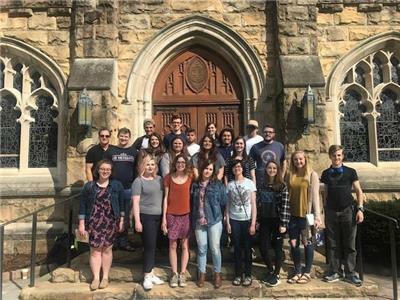 Dr. Andrew Lee's English class stands outside the chapel at the University of the South during a research visit. Pictured are (back row, left to right) Colson Hagan, Tylor Hudson, Kalee Isham, and Noah de la Rosa; middle row, Dr. Andrew Lee, Austin Campbell, Sarah Anne Gabriel, Audie Ash, Matt Aprea, and Trevor Arrowood; front row, Kyle Somer, Ashlyn Elder, Abigail Cribbs, Lydia Horrigan, Michaiah Samples, Cana Cooper, Bri Gwathney, and Joey Zalusky. Dr. Andrew Lee, professor of English, and Dr. Donna Summerlin, assistant chairperson of the Lee University Department of Language and Literature, took students from Lee’s Theories of Reading and Writing class to Tennessee Williams’ play “The Glass Menagerie” at the Chattanooga Theatre Center. 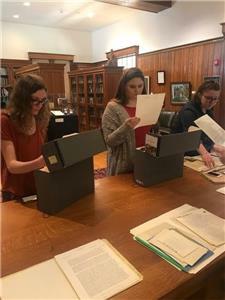 The students also traveled to the University of the South in Sewanee, where they received a private tour of the Tennessee Williams’ archives. Students were able to see the playwright’s original type-written manuscripts of some of his other plays. After the archives tour, the group stayed at the Smokehouse Lodge on Monteagle. For more information on Lee’s Department of Language of Literature, contact 614-8210.